We will be revisiting the site after the winter to see if more boardwalks are needed. 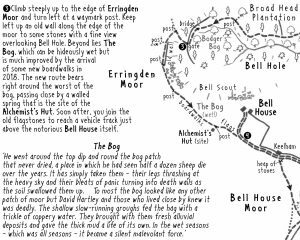 Several of the paths across Bell House and Erringden Moors above Cragg Vale have been pretty impassable for many years, with many the unwary walker ending up to their knees in the mire. Thanks to a very generous local benefactor, Mrs Julia Grey, CROWS has recently been able to complete a project to deal with the impassable paths. 1. Hebden Royd path 072 runs from Bell House towards the edge of Broadhead Clough. Part of the route was irredeemable (i.e. the causey stones were well buried under a bog) so the Council agreed to divert the path along a relatively drier line above. CROWS has now done this and waymarked the new route. 2. At the end of the desire line, there are several really boggy crossings so six 10ft boardwalks have now been put in. 3. Hebden Royd path 045 runs off from Hebden Royd 072 around the edge of Broadhead Clough towards Old Harry Lane and Snail Lane. This is currently crossed by several deep water channels, so walkers have had to try and find a dry line (difficult, and in doing so they have caused damage to this SSSI area). To solve the problem, CROWS have put in two 18ft and five 10ft boardwalks, together with some visible waymarking. 1. 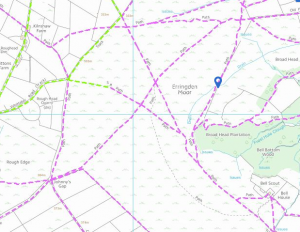 The new diverted path runs North West from Bell House between the old route of Right of Way Hebden Royd 072 (purple) and the black and white dotted line. 2. The first run of boardwalks further on Hebden Royd 072 is at the junction of paths Hebden Royd 045 . 3. The blue marker indicates the location of the boardwalks on Hebden Royd 045. 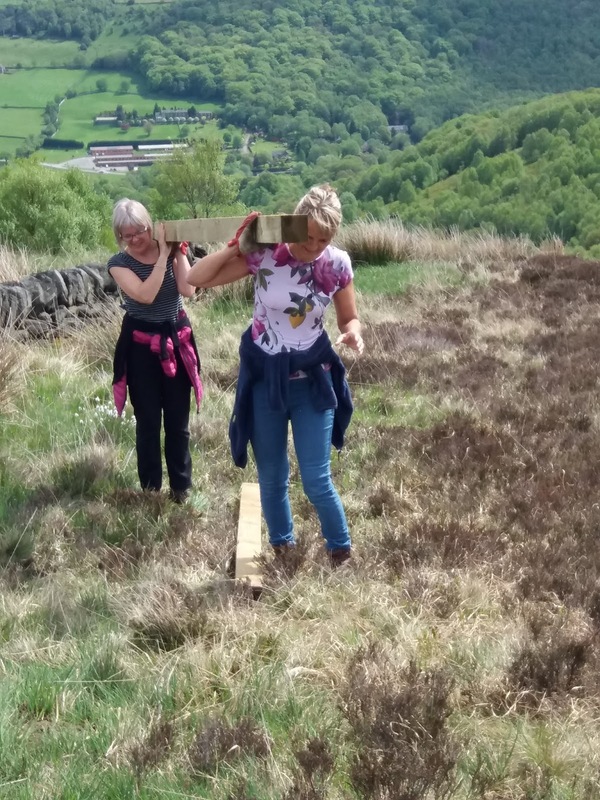 This is one of the boardwalks that have now been installed on Erringden Moor helping to make this important route much more accessible. Because the site is a SSSI we want to cause as little damage or change to the ecology. Boardwalks have a very limited footprint, especially compared with other solutions and they can be put in a great speed, so causing minimal disturbance to any bird and wild life. The boardwalks will initially be somewhat unsightly, but our experience is that as the sedge grass grows it will eventually partly disguise them . A small section of Christopher Goddard’s newly published coiners walk. The new route was officially opened around 5.30-6.00 pm on Wednesday June 6th by Robin Tuddenham, chief executive of Calderdale, who thanked Mrs Julia Grey for the donation she had made to make this possible. Around forty people attended and they were treated to a rendering of ‘Over the Boardwalk’ by the Drifting CROWS! Further details can be found on CROWS blog at http://communityrightsofwayservice.blogspot.com/search/label/Boardwalk%20new%20%26%20repairs . Thanks to the help from numerous local walkers, runners, mountain bikers, as well as few interested passers-by, about 400 pieces of timber were carried from Bell House to the various locations of the boardwalks. We were overwhelmed with the support we got for this and thank everyone that came along to give a hand. Go out the back of the station (under the railway line) and walk up the concrete track ahead. Go through the hamlet of Wood Top and keep ahead up a setted road. At the top, turn left. Follow the track through Great Jumps Farm, passing two remote houses. After the second house, turn right up a walled path to a stile. Here you can go go left across the moor where the new boardwalks are. 1. Daisy Bank – Go up Cragg Road and just before an old fire station, turn right and immediately left along Nest Lane. Take the path bearing off to the left called Daisy Bank. You will go up some steps, past a conifer plantation where you keep ahead to a stile at the very end of the path. Here you go left across the moor on the path where the boardwalks have been installed. 2. Through Broadhead Clough – Walk up the Cragg Road (or get the bus) to Dauber Bridge (1.5 kms) and turn right on the concrete track for 1km. At a T junction, with a Yorkshire Wildlife board, go straight ahead on a path into the woodland. 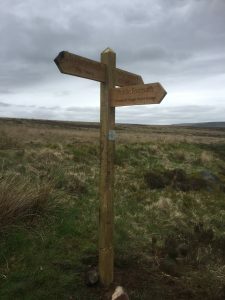 The path climbs through and then out of the bowl, up some steps on to the moor, where you will see a newly installed finger post. Here you can go right and cross the moor over the new boardwalks or turn left towards Bell House and you will also cross some of the new boardwalks.